I’ve been seeing mangoes and pineapple at the grocery store for weeks now, but I haven’t felt tempted to buy them until recently. They’re such bright, cheery fruits that remind me of sunshine, green grass and long summer days. The weather in Pittsburgh has been anything but until this weekend. After having 10 inches of snow on Wednesday, we celebrated the first elongated day of the year yesterday with 70-degree weather. I’ll take it! The nice weekend weather called for some fresh fruit. 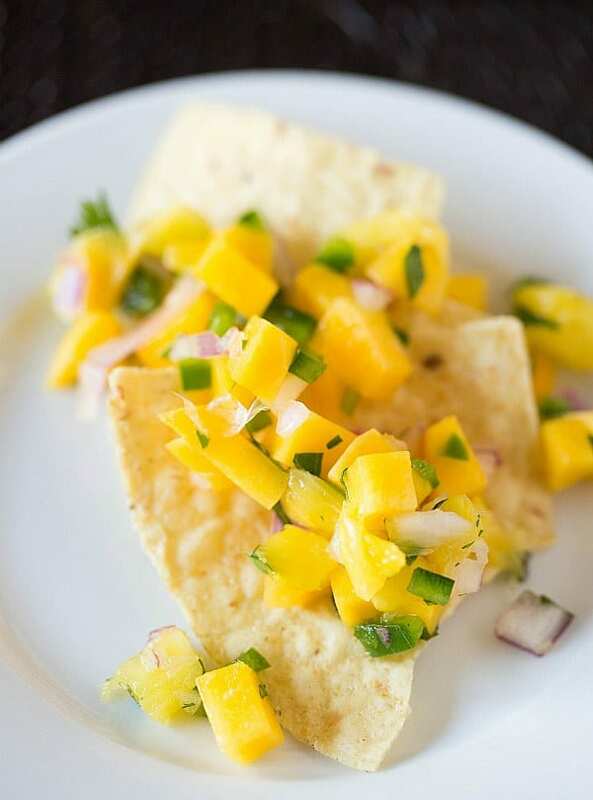 A couple of weeks ago, my Chief Culinary Consultant and I had a family dinner at his cousin’s house, and she had a mango salsa and chips for us to munch on before dinner. It was delicious! On Saturday, feeling inspired by the gorgeous weather, I loaded up on mangoes and pineapple at the grocery store and made my own! 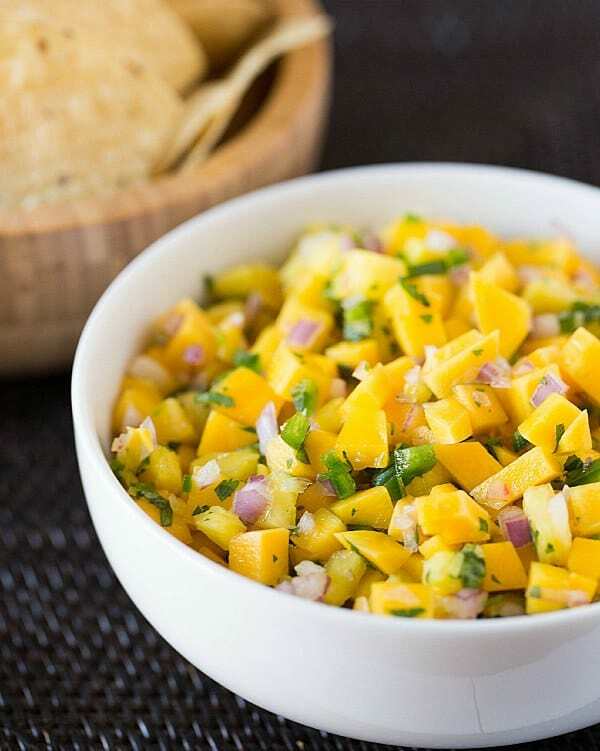 I love how incredibly fresh-tasting this salsa is… between the mango and pineapple, the bite from the red onion and jalapeño, and the pop from lime juice and cilantro, it’s an amazing combination. Not only is it fabulous, but it takes mere minutes to make. If you’re a master with the chef’s knife, you’ll have this thrown together in 10 minutes! We ate this with regular tortilla chips, although my CCC’s cousin served hers with lime-flavored tortilla chips, which were great, as well. I’m thrilled to have another salsa recipe to add to my current repertoire of restaurant-style and black bean salsa. Now that we seem to be turning the corner for summer, I’m ready for some warm-weather recipes! Do you have a favorite salsa recipe? Feel free to share it below! 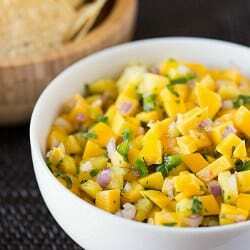 A bright and fresh-flavored mango salsa with pineapple, jalapeños, red onion, lime juice and cilantro. Mix together all of the ingredients and season with salt, to taste. Serve with your favorite tortilla chips. The salsa can be stored in an airtight container in the refrigerator for up to 2 days. delicious – added a little red pepper and used sweet onion as I didn’t have a red pepper. Can mango be blended w/another fruit, and/or maybe sour cream to make dip or salad dressing? Yrs ago I made mango & cherries chutney, but never tried blending, am not sure how well mangoes keep consistency. I’ve never tried to do this, so I’m not sure! 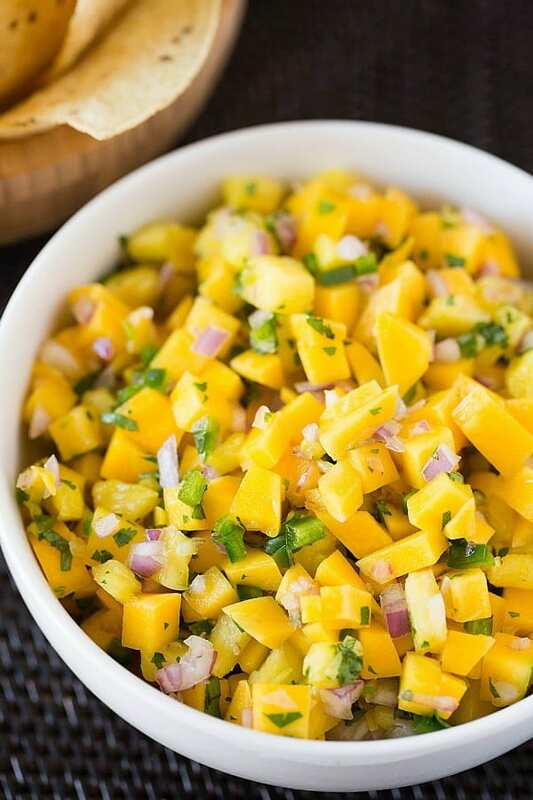 We just moved to Hawaii not long ago and tried some amazing mango pineapple salsa at a local food truck rally (we paid $10 for a small container!!) So I was excited to try your recipe. It was even better!!! Two thumbs up!!! Thank you! This recipe is delicious as-is. Another way I use it is to place all of the ingredients into a food processor, and pulse until lightly pureed. Then I pour the mixture over a nice white fish or grilled chicken breasts. 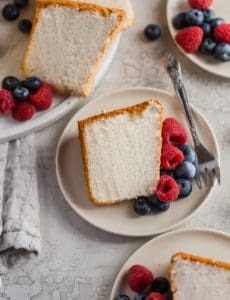 I made this tonight using your recipe! Absolutely wonderful! I deviated a little by adding an avocado and a red bell pepper. This would be delicious over some grilled tilapia or even chicken! I’m also holding out for some sunshine and warmth — it’s snowing here in NY! What a beautiful burst of color! Wonderful post! Love the combination of mango, pineapple and jalapenos! Sounds electric! I would throw black beans in with this!! YUM!